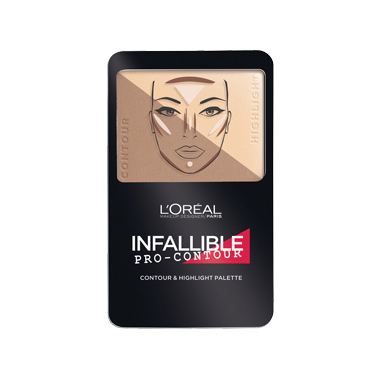 The L'Oreal Paris Infallible Pro-Contour Palette makes contouring easy. Use the pro-contour brush to enhance and define features for a professional contoured look. Perfectly coordinated highlighting and contouring shades blend easily after applying for a flawless contoured look. How to Use: Step 1: Use the lighter shade to highlight and create extra dimensions. Step 2: Accentuate contours with the darker shade. Step 3: Blend and buff for a professionally defined look. A little too light for my skin tone. I can how ever use it as eyeshadow. It is still a nice contour palette. It's a nice contour palette, I do wish it was a little darker. It's a little too light for my skin tone, the brown doesn't really show up.